If you’re a fan of the popular science educator Dr Karl Kruszelnicki and the comedian and radio show host Adam Spencer make sure you watch their new six part science series Sleek Geeks on ABC TV starting 3 January, 2008 at 8pm. 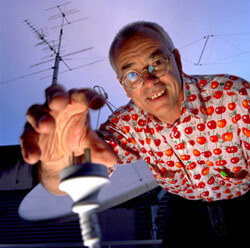 Dr Karl and Adam have previously united to do live Sleek Geeks shows around Australia to promote science. Dr Karl Kruszelnicki AM, pictured with his usual bright shirt 🙂 used to be a “proper pukka scientist, engineer and doctor”, but is currently an author and science educator on radio, television and through the many books he has written. He is the Julius Sumner Miller Fellow at the University of Sydney, in the Science Foundation of the Physics Department. Adam Spencer began his career in radio by winning the Triple J raw comedy championship in 1996. From there, he became the well known co-presenter of Triple J Breakfast between 1999 and 2004. Adam holds a first class honours degree in Pure Mathematics and has an immense interest in science. Adam’s “Little Book of Numbers” has been translated into many languages and he has since written another called “More Mind Numbing Maths”. Hey I’m a geek slowly coming out of the closet! And I like maths too! Yet perhaps I might qualify for ‘Super Nerd” status like Adam and Karl because I’ve invented Australian Numerals! Yep – I’ve been working on this idea for over 20 years as you can see from my website. So fellow Aussies – remember you heard about it here! I caught the tail end of your new show last week and was laughing out loudly when you were demonstrating to viewers how to clean their tongues. There is actually an implement designed by some clever person to do the job. My parents have used it since I was a wee babe, I am now 40, and they got it in India. It is made from metal and you scrape it from the back of your tongue to the tip. Naturally, you do it gently so as not to scrape off your tender taste buds. I have known it to be referred to as a “jibee”(not too sure how it is spelt.) A lot of people in India use this religiously for oral hygiene.